Do you need something new to listen to in the car? 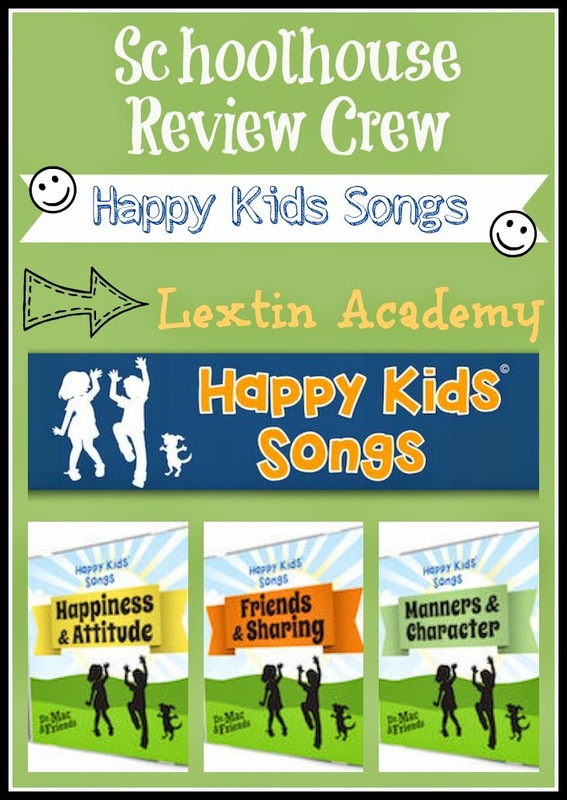 We were needing some new uplifting music so we were excited to review Happy Kids Songs! Our new songs were from the albums: Friends & Sharing, Happiness & Attitude, and Manners & Character. We also received the workbook of lyrics and activities – Happy Kids Songs Workbook: Hands-on Activities to Build Character, Social and Emotional Skills. Happy Kids Songs has created adult-quality music that addresses the common issues that children confront such as shyness, manners, sharing, and feelings. Through age-appropriate music, kids can learn how to best handle different situations as well as build personal character. The songs are written and sung by Dr. Mac, (Don MacMannis), who is the songwriter for a popular PBS TV show series. Many of the songs also feature children singing as well. We also received the Happy Kids Songs Workbook: Hands-on Activities to Build Character, Social & Emotional Skills. This workbook contains 125 pages of activities and song lyrics. There are coloring pages, color by number activities, mazes, dot-to-dot activities, word searches, and drawing prompts. The back of the book contains short lesson plans for each song that offer ideas for games and activities to reinforce the concepts taught in the songs. The songs and activities are geared for ages 3-8 but can be enjoyed by the whole family! We were running a few errands with the kids and everyone was cranky in the car. The younger girls were arguing, Tiger was throwing things at them, and Curly was complaining about the noise level. Little Punkin kept shrieking every few minutes to remind us that she was in the car too. I had asked them several times to keep the noise level down but they weren’t listening very well. Finally, my husband turned to me and wearily said, “Don’t you have some ‘happy’ songs on your phone? Please turn them on now!” That’s when I remembered our new CD’s! I quickly turned them on and turned up the volume. Within 30 seconds the entire back seat was quiet as everyone listened. Punkin was bouncing along to the beat in her carseat. Sweet peace!! So how did we use this product? It was our go-to play list when we got in the car. We also listened at home as we did chores. I let the kids take turns working on workbook pages. Tiger (age 6) preferred the word searches and Curly (age 8) enjoyed the color by number activities. Bee liked the dot-to-dot pages and Ladybug was a fan of the coloring pages. There was something for everyone! We did a few of the suggested activities as well. Our favorite was for the song Quirks where we learned that everyone is unique and special. We looked at pictures of snowflakes and enjoyed their one-of-a-kind shapes. Then we made our own paper snowflakes. Then each child put on a little show to showcase his or her unique talents. Bee was the ballerina, Curly sang for us, and Tiger gave a demonstration about his Nerf guns. Little Ladybug put on a puppet show with the help of her siblings. I thought the concept of these songs sounded really cute but I wasn’t sure how much my kids would learn from simply listening to songs about manners and character. I learned that music is a powerful tool. My kids were left talking about what a “kudo” was and they enjoyed complimenting each other to share kudos. These songs held my kids’ attention and didn’t drive me crazy listening to them (this is very important for kids’ music!). I was very surprised with how much my kids enjoyed the beat of the music and sang along with the songs. Whenever we played the CD’s in the car, we had instant quiet as everyone listened along. The song writer clearly understands the types of music that appeal to kids. The activity pages in the workbook were fun for my kids. I really appreciated having the song lyrics written out so I could review them with my kids to make sure they understood the meaning of the songs. I also enjoyed the suggested activities and object lessons to help kids understand the concepts. These ideas really helped me begin our discussion of the song topics. These are great CD’s of upbeat, kid-friendly music that can be enjoyed by adults as well. The song topics and themes are geared toward the fears, feelings, and situations that kids encounter on a daily basis. Overall, I was pleasantly surprised by how much my family enjoyed these CD’s and how quickly my kids were singing along to the songs and discussing the concepts. It was a painless and fun way to introduce different concepts of good manners and character to my kids. We loved these songs and the messages they conveyed! You can download each CD for $4.95 each. You can purchase singles for 99 cents. The workbook pages to accompany each CD are a free download with the purchase of the songs. You can also buy the printed workbook for $12.56.